Honey who shrunk my paper? In the great city of Cincinnati, there is a change afoot. The local newspaper, The Cincinnati Enquirer, has decided to shrink every edition of the paper, a veritable “Mini-Me” for any of you Austin Power fans out there. I don’t like it! It’s not that the font is too small; in fact, it doesn’t appear any smaller – I just don’t like the change. It is too compact. It doesn’t grab my mind’s eye and beckon me saying, “Read me.” Any sense of authority seems to have shrunk with its now diminutive stature. When you open it and stretch your arms back to read, there is no crisp crinkle then snap of the paper. Quite frankly, there is no stretch of the arms, just a pathetic bend of the elbow. Not to mention there is virtually no paper to hide behind for a moment. Before, it was obvious to people around me that I was reading, be patient and wait a minute. Not Now, I may as well be reading any old insignificant publication I can pick up for free stacked in the colored metal bins outside the grocery store. Speaking of color , they have also recently snuck in color comics on other days besides Sunday. As I was sharing my dislike for the new format, my ten-year-old, Joshua, chimed in, “And they made the comics in color on other days besides Sunday. Don’t they know the color makes the Sunday comics special?” I agree with Joshua. I remember feeling special reading the Sunday comics as a child. It’s a little thing, but printed in color set them apart. Do we always have to indulge ourselves and make everything ordinary? 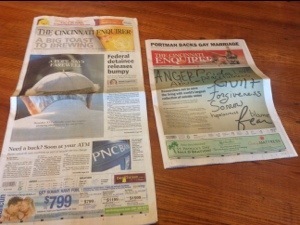 And now, the powers that be at The Cincinnati Enquirer have made the paper a “little thing,” something to be dismissed. I am going to give it my best to embrace this change. I love reading the paper in print. The smell of the ink and the touch of the physical fibers between my hands. The alive interaction with it as I fold and subdue it to just the right position for comfortable reading. My paper and I had a relationship, albeit, it was inanimate, but it was ours. I understand printed press publications in general are struggling. Electronic media and the rising cost of everything under the sun is making it difficult for newspapers to turn a profit. I guess, I am just old-school. I didn’t think the paper was broke and needed a facelift. Meddling with my time-honored traditions wasn’t necessary. There is a strange comfort in this fast-paced , ever-changing life for some things to stay the same, offering a sense of nostalgia each day. This entry was posted in Life and tagged Austin Powers, newspaper, The Cincinnati Enquirer. Bookmark the permalink. I too enjoy the printed word. I carry actual books. I thumb through magazines. I love the Sunday paper. Call me old-school – I consider it a compliment.